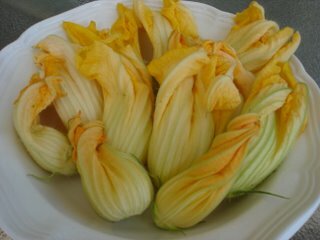 Yesterday my awesome friend and extremely knowledgeable nutritionist reminded me that I can eat the flowers of my zucchini plants. 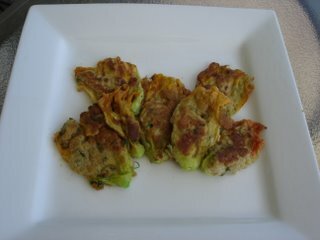 You should have seen the look on my husband's face when I told him we were having zucchini flowers for dinner. Anyway, these babies turned out totally delicious. I can't wait to make more. I just breaded them with some sprigs of fresh rosemary and sage from my herb garden and fried them with a bit of olive oil. I served them up with a salad (lettuce from our garden) topped with avacado, yellow pepper, hemp seed nuts and pecans. It was a wonderfully light dinner for a hot, hot day. This morning I was going to bake something with the large zucchini gifted to me, however it is so hot here already that there is no way anybody sane would turn on their oven (unless they had air conditioning of course). The zucchini flowers look yummy. I've been hearing a lot about them lately and was thinking of trying them. Glad to they know they turned out well. Your salad looks tasty too. Thanks vegan diva. 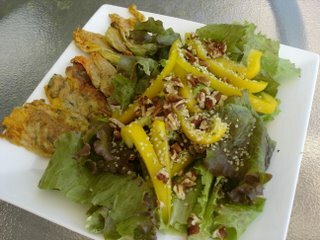 This recipe definitely wasn't vegan since I used eggs, but I am sure you could create a vegan equivalent. Your blog looks fantastic. I added to my list of blogs that I check. Happy B-Day to your grandma. Mine turns 81 on August 7th. What a blessing to still have our Grandmas! looks like you had a busy weekend... Although with all of your cooking, growing, and research I am beginning to wonder if you are some kind of super mommy. Still can't get an email through. But I have set up the blog if you want to chat. wow - those are so pretty! I bet they tasted great! Uh-oh. Better hide these from Omniman--he's eat the whole plate. They look gorgeous! Isn't that gorgeous? And very delicious looking as well. What a shocker, to discover that you can eat flowers like this. Nice going. Very Happy Birthday Wishes to your Grandma on Aug. 8th :) 81, that's fabulous!